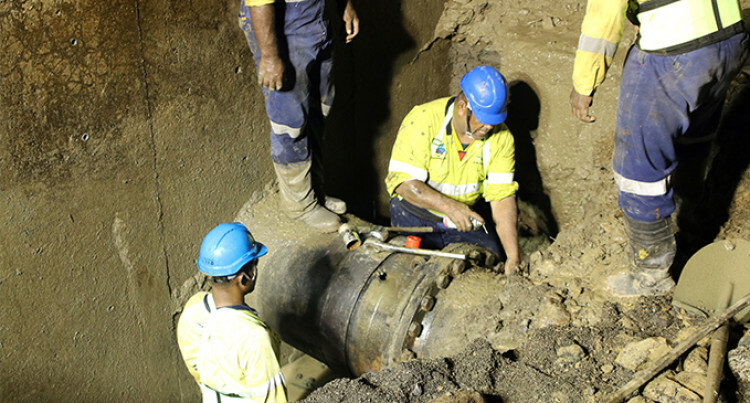 The urgent repair works carried out by the Water Authority of Fiji (WAF) to the major water leakage along the Vaturu-Nagado high-pressure pipeline were conducted and completed as scheduled. WAF Board Director, Mr Kamal Gounder said the works were completed by 4 AM Sunday morning, 10th February 2019. “The WAF crew members started off their work along Vaturu by de-watering the high-pressure pipeline from the Vaturu Dam to the Nagado Water Treatment Plant. They were also able to isolate the leakage point to conduct the repairs without causing any major disruption to the Nadi and Lautoka customers,” explained Mr Gounder. “The leakage was from the Gibault joint on the tee spigot connecting to the 711mm line. The leakage was due to a burst and worn out rubber from the joiner. This shows the aging infrastructure and WAF is working to conduct necessary upgrades to the existing water systems around the country,” said Mr Gounder. WAF General Manager Customer Services and Acting General Manager Operations, Mr Sekove Uluinayau said that with the repair work being completed, water restoration is currently in progress. “We are now working to get water supply normalized to the areas that were affected. WAF is now in the process of re-pressurizing the high-pressure pipeline from the Vaturu Dam to the Nagado Water Treatment Plant in order to restore the full capacity of what is being received at the water treatment plant,” said Mr Uuinayau. Water supply is expected to be normalized by 6 AM Monday morning, 11th February 2019. “In the meantime, WAF continues to cart water to customers in the affected areas as well as to the community tanks that have been placed around in strategic locations in communities that have water supply disrupted,” said Mr Uluinayau.